Our views on what women can be are shaped by the images we see on screen. But who creates those images? When the majority of film and television is directed, written, and produced by men, women are largely misrepresented in or even written out of our culture’s narrative. © 2019 Adobe. Used by license. So friends and filmmakers Katrina Medoff and Tracy Sayre took action. In just one year, they made 17 short films with over 300 professional female filmmakers. 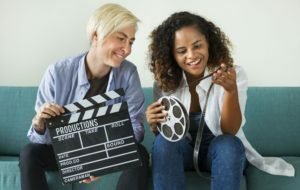 They created the Women’s Weekend Film Challenge to tackle the gender imbalance in Hollywood and the harmful ways this disparity behind and in front of the camera influences our society. Find out how you as an audience member can join this movement and redefine how women are represented on screen. Katrina Medoff is an actor, writer, and producer. She’s also the editor-in-chief of BORO, a magazine about her home neighborhood of Astoria, Queens. She is the founder and co-director of Women’s Weekend Film Challenge.